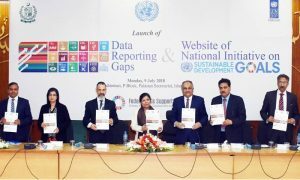 UNDP Report On Gaps In SDGs Data Reporting: The Planning Commission, in collaboration with the UN Development Programme (UNDP), on Monday launched a “Data Reporting Gaps” study to help monitor achievements of Sustainable Development Goals (SDGs) by 2030. While launching the study, Minister for Finance and Planning and Development Dr. Shamshad Akhtar emphasized that Pakistan must step forward by developing a knowledge base and called the Planning Commission to serve as a “knowledge hub” and maintain a main body of literature which should have an integrated approach to study different sectors like energy, water and agriculture. Dr. Shamshad Akhtar emphasised that we have to jot down as how the provincial and local statistical organisations will take forward the enhancement and augmentation of data itself, noted that a significant number of capacity development programmes would be required for not only what we have but also to manage the missing information.